Perhaps the greatest measure of an actor's success is how well they portray characters which are far removed from their true nature. It is also true that the most enduring stars are sometimes the ones who work harder at being great actors rather than great stars. Richard Widmark got his start in Hollywood playing psychopathic heavies, and while he did what was required to promote his films, he did his best to stay out of the public eye, preferring his work to speak for him. Born Richard Weedt Widmark in Sunrise Township, Minnesota, 1914, his father was a traveling salesman who struggled to support the family. They moved several times around the Midwest, which meant that Richard had to work hard to fit in and make new friends. He was pretty good at it when the family finally settled in Princeton, Illinois, Widmark played on the football team and became the class president. At the age of four, he became a serious movie buff when his grandmother began taking him to the theater and he became wrapped up in the Universal Horror characters like Frankenstein, Dracula, the Wolfman, and the Mummy. 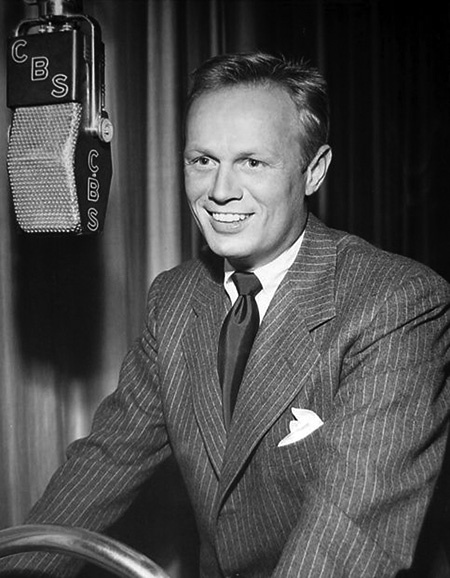 Widmark enrolled at Lake Forest College to study law but was bitten by the acting bug when he appeared in a student production (the play was Counselor-at-Law). He completed his Bachelor of Arts degree and took a job at the college as a speech and drama instructor, but two years later a call from a classmate brought him to New York to work in radio soap operas in 1938. From soaps, it was an easy move into dramas, and he created the role of Front Page Farrell from 1941-42. He also worked with Norman Corwin on Columbia Workshop and other productions. He tried to join the Army on at least three occasions in 1943 but was denied entry because of a perforated eardrum. 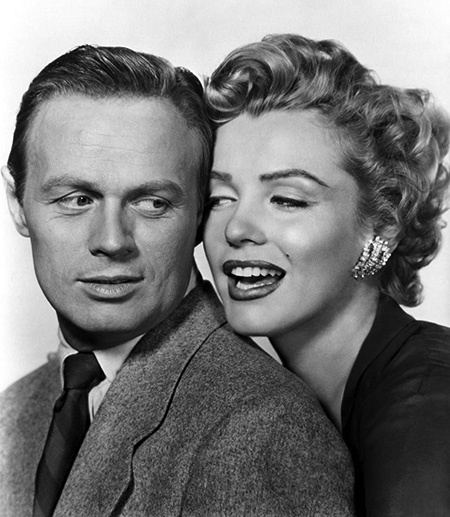 Widmark did find work on Broadway, debuting in Kiss and Tell (1943). Most of his stage roles were nice guys, worlds away from the types Hollywood would use him for. 20th Century Fox gave him a screen test for the role "Tommy Udo" in Kiss of Death (1947). Director Henry Hathaway turned him down for the part, but studio boss Darryl F. Zanuck saw something in his clean-cut persona, and he was especially effective as a giggling psychopathic murderer. The role won him his only Oscar nomination (for Best Supporting Actor) but the statuette went to Edmund Gwenn for Miracle on 34th Street. Unfortunately, that much success early in a movie career leads to type casting, and Widmark was forced to follow up by playing a number of psychotic heavies. Most of his early work was in noir thrillers and Westerns, but he finally broke out of the heavy role when Elia Kazan cast him as the hero (against Jack Palance as the heavy) in Panic in the Streets (1950). Another bad guy role was just around the corner in No Way Out (1950), the film which marked the film debut of Sidney Poitier. Widmark's character spends most of his screen time hurling hateful racial slurs at Poitier. After every take, Widmark felt he needed to apologize. By 1953, with his seven-year contract with Fox about to expire, Zanuck decided to demonstrate to Widmark that the studio had plenty of star-power to draw upon and his services would no longer be needed. Widmark was given fourth billing (under Spencer Tracy, Robert Wagner, and Jean Peters) in Broken Lance (1954). As an actor who enjoyed acting, Widmark was perfectly content to be let go by Fox. As a freelancer, he created his own production company, Heath Productions, not so much as a money-making concern but to ensure that he had creative control of his projects. Heath emphasized meaningful social dramas, but he still appeared in "he-man" roles, even upstaging John Wayne in the patriotically suicidal epic The Alamo (1960). While Wayne's bombastic Davy Crockett carried the film, Widmark's thoughtful Jim Bowie won over critics. His continued presence in Westerns led to co-starring with James Stewart in John Ford's Two Rode Together (1961). Ford feuded with his stars over various issues (most notably Stewart's hat, he insisted on wearing the same battered Stetson which had been part of his personal for a decade of successful horse-operas). Both actors had failing hearing and their receding hairlines needed help from the makeup department, leading Ford to complain that he was directing "a pair of deaf toupees". However, Ford cast Widmark again in his apologetic Cheyenne Autumn (1964). Widmark continued to work in A-ist projects until retiring in 2001. After battling illness for several years, exacerbated by a fall in 2007, Richard Widmark passed away at his home in Roxbury, Connecticut, on March 24, 2008. A Star on the Hollywood Walk of Fame at 6804 Hollywood Blvd was dedicated to honor contributions to Motion Pictures by Richard Widmark. I wish the best for your health and business in the coming year. I’ve been heavily confined to bed or Phys Therapy the last few weeks due to a major spine operation. Do you know what keeps me afloat as I heal? Your magnificent collection of OTR !